The Toughest Job in the World Is A Real Mother - 10 Minutes of Brilliance: Smart, Funny, Creative and FREE! It’s Mother’s Day 2017 and we’ve got a lot of ground to cover, so fasten your seat belts. (Wait. Didn’t Attorney General Sessions outlaw seat belts? Oh no, sorry, that’s next week!) One wish, please. If you like today’s blog, please LIKE IT, Tweet it or send it to your Mother. After all, she’s got you for a kid, she deserves a little honor and a few laughs. 1. First up, a description of “The Toughest Job in the World.” This Job is so tough, no man on Earth could ever handle it! 2. Next, An Open Letter to Donald Trump. From His Mother. The President’s Mother (Earth) is not happy with Donald Trump. Here’s why! 3. Here’s a Tribute to my Late Mom, although she was hardly ever late, usually right on time,. Well, except in the end. But then again, aren’t we all? 4. What Not to Buy Your Mom for Mother’s Day! Don’t honor your Mom’s never ending love with the gift of a toaster oven. 6. STAN Meet His Maker. The notorious STAN meet his Mother for the first time. Again! STAN: Cool. I’m gonna meet my Mom today? HARRIET: Shut up, STAN. It’s not time for us to talk yet. And now, let the festivities begin. 1. The Toughest Job In The World Is A Real Mother! But whether you dislike the President’s Spokesman or you hate him intensely, you’ve gotta give him credit for lowering his integrity and consistently delivering the President’s ever changing messages. True, it’s not easy to stand there in the briefing room like Sean does, naked, sans truth, and try to convince everyone that the egg on your face is really an omelet. But Shaun Spicer does not have The Toughest Job in the World, nor do any other members of the Emperor has no Clothes’ administration. Asst. 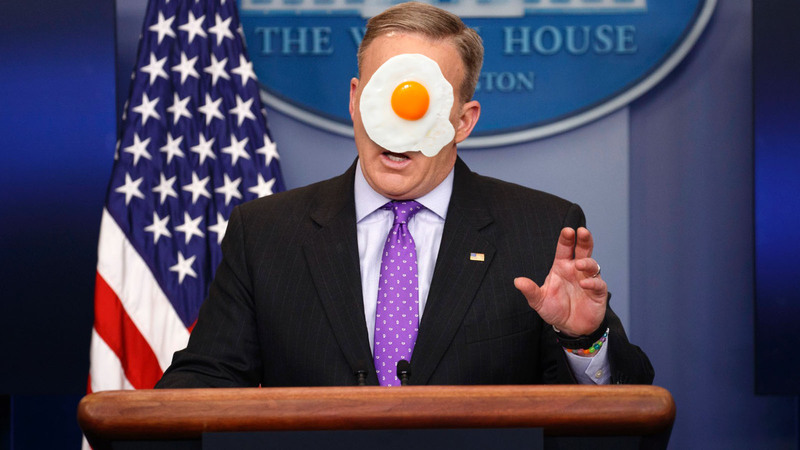 Liar-in-Chief, Seam Spicer, insisting the egg on his face is really an omelet. Because even those jobs pale when compared to the stress, aggravation and sheer patience that Mothers exhibit every day. It’s no wonder so few applicants applied. The requirements were a real killer. If you haven’t guessed it yet, The Toughest Job in the World is a real Mother. No, really, it’s being a real mother, a job so tough and only women can handle it. Here’s some footage from people who applied for the job. If I forget to mention it, Happy Mother’s Day to Moms Everywhere, They’re America’s most valuable natural resource! STAN: Hey, what’s goin’ on? I smell something funny here. HARRIET: Something you stepped in? STAN: No. No. It’s Goldman. The writer of this blog. STAN: Goldman. Goldenberg. Whatever. Goldbloom’s trying to scam his Readers. STAN: He runs “The Toughest Job on the World” blog every Mother’s Day. STAN: I know. And it’s all because of me. HARRIET: Don’t flatter yourself, STAN. Don’t forget, you’re imaginary. Jack writes everything you say. STAN: Yeah, right, and I suppose the Pope is Catholic. HARRIET: Pretty much. Look, STAN, it’s true Jack runs this story every Mother’s Day, but he’s updated it so even die-hard Readers won’t mind. So please, just let Jack continue. STAN: I will, it’s not like I always have to have the last word. STAN: It’s not like I always have to have the last word. Where was I? Oh yeah., I’m pretty sure my Mom is reading this 10 Minutes of Brilliance blog in Heaven. I doubt she’s in Hell or Pittsburgh, because Mom led a good life and was never very fond of those places. Anyway, I hope I’ve made her proud. 2. An Open Letter to Donald Trump from His Mother. Mother (Earth). You are stripping away regulations that will keep my air and water clean. You have tried to take away health care for millions of my residents. You are ignoring those who are already born., eliminating funding for programs that aid women and children. You have threatened to despoil the beauty of my National Parks. On Mother’s Day, think not just of your children and grandchildren, Mr. President, but of all children and grandchildren who deserve the right, no matter where they were born, or how wealthy they are, to breathe unpolluted air, drink clean water, be protected from dangerous chemicals, and enjoy the natural beauty of their world. As you play golf at Mar-a-Lago this weekend and fret over the difficult job of being President, remember those who work hard to allow you your lavish lifestyle. Please take care of me, and all those already living on earth. I am the only Mother Earth you will ever have. The above Open Letter appeared in the NY Times on Friday, May 12 as a full page ad. 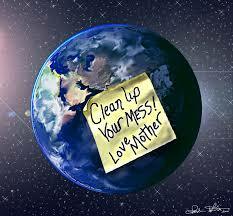 To express your views, visit Keep Mother Earth Happy. Or better yet, call the President at 202-456-1111. Leave this message: President Trump. Mother Earth is not Happy. NOTE: He will probably not answer the phone. He may be playing golf, just destroying the environment or canceling healthcare for those who can least afford it. hey, he’s a bust mna. Who knew the Presidency would have been this taxing? 3. A Tribute to My Mom. Who Had Three Wonderful Children. Oh yeah, and me. A few years ago, I ran my Mother’s Day blog 2 weeks AFTER Mother’s Day. Boy, was my Mom upset. I felt her wrath all the way from Heaven. (I’m pretty sure she’s in Heaven, because she never liked Hell or Pittsburgh and sometimes couldn’t tell the two apart. But true to the spirit of my Mom, she took the blame and apologized for my tardiness. She wrote,” PLEASE EXCUSE MY SON JACK FOR POSTING HIS MOTHER’S DAY BLOG TWO WEEKS LATE! My Mom always had a great sense of humor. She loved to pose in pictures with famous fictional characters. 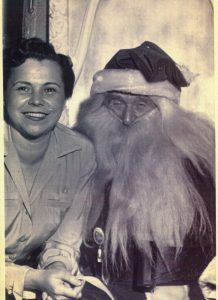 Here she is with one of the part-time employees from my Dad’s store who was prone to wearing red suits. My Mom and Santa Claus. My Mom is the one on the left. I owe my Mom a lot. Besides my giving me my twisted sense of humor, my Mom gave me a sense of wonderment and curiosity about the world. She also had a love of learning, and taught me about the responsibility to stand up for what’s right and call out what’s wrong. It got us both in a little trouble, but we wouldn’t have it any other way. My Mom lived to be 93 and for most of those years she was full of life. She got her Masters Degree in her late 70s. In a wheel chair. I can’t imagine anything that would have stopped her from doing anything she wanted to do. It drove my Dad crazy. 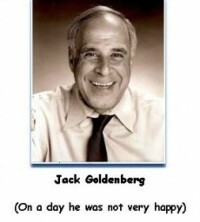 STAN: Why is Goldberg going to go on and on about his mother? HARRIET: Because this Sunday is Mother’s Day. STAN: Well, I’m sick and tired of hearing all this cr*p about Mothers. Hey, did you see that? I tried to say the word cr*p, dam* it, but Goldberger bleeped it out! He really s**ks. HARRIET: Well, this is a family blog, STAN. Now, let Jack finish. And try to remember you’re just an imaginary character Jack dreamed up. Or he’ll bleep out more than your off-color language. STAN: Off color? It’s blue. My Mom was also a bit of a rascal. Not a trouble maker, mind you, but someone who didn’t mind giving the world a little “oudgie” when it deserved it. Here are a few stories that showcase my Mom’s desire to always keep the world on its toes. Ever since I can remember, my Mom didn’t get along with her youngest brother, my Uncle Donald. She wasn’t hostile or mean to him. She often loaned him money to help him out of a jam. and he got in more jams than Smuckers. But my Mom did think her brother was lazy and stupid and she had no problem letting him and the world know it. After my Mom graduated college (at 18), she became a substitute teacher. One day she had to substitute for a history class my Uncle Donald was in. She called on Donald throughout the class, embarrassing him again and again because he didn’t know any of the answers. After class, my Mom wrote a note, sealed it in an envelope and told Donald to take it home to “his” Mother. If you’re following this story carefully, you’ll note my Mom and Uncle Donald had the same mother, a k a my grandmother. When my grandmother read the note, she was so mad, Donald thought he saw steam coming out of her head. This may just be urban legend, or perhaps a tea kettle nearby. Hard to say. Anyway, there was no signature on the note, so my grandma grabbed Donald by one of his big, flabby ears (oh no, wait , that was Dumbo) and she dragged him to school the next morning to search out and destroy whoever wrote that damming note about her son. When she got to Donald’s class the next day, she saw her daughter, my Mom, standing at the front of the class. “Bernice, did you write this note?” she asked. STAN: OK, not a bad story. Not as boring as most of Goldman’s stories. But I still don’t know why everyone makes such a big deal about Mother’s Day? HARRIET: Don’t you remember good things about your Mom? STAN: (STAN MUMBLES SOMETHING INCOHERENTLY.) Fhdignet hobad mdtedh! HARRIET: What? What did you say? NOW STAN’S FEELINGS WERE REALLY HURT. IT WAS BAD ENOUGH TO NEVER HAVE HAD A MOTHER, BUT NOW HARRIET CONVINCED STAN HE WAS JUST A CHARACTER INVENTED TO MAKE 10 MINUTES OF BRILLIANCE MORE INTERESTING. STAN: That’s it, Harriet! I’m outta here! I QUIT! I want off the blog. It’s obvious I’m not important to anyone here. HARRIET: Wasn’t that a touching story, Stan? You know, a mother’s love for her children is the strongest force in the Universe. It’s stronger than Hate, Greed or Power! STAN: I guess so. But I still don’t see how it relates to me. I’ve never even had a Mother. HARRIET: Well, you might have one one day, Stan, you never know. Maybe Jack will write your Mother into this blog. STAN: Never happen, Harriet. Never in a million years. My Mom around 1950, with two of my three sisters, in some Leave it to Beaver type neighborhood. 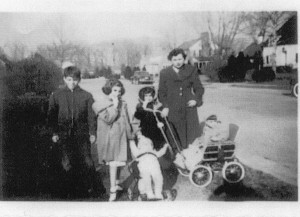 The little bugger in the baby carriage is me. It’s difficult to see, but I had a pen and paper in my buggy. I was working on my first blog. When my middle sister, we’ll call her Rainy, because that’s her name, was 7 years old, she tried to climb out of her crib and got her leg stuck in the slats. Rainy screamed for help and my Mom came running. “Don’t worry, Rainy, I’ll get you out.” With that, my Mom ran out of the room. A minute later she returned with Old Joe, a neighborhood handyman. Old Joe was carrying a big rusty saw. 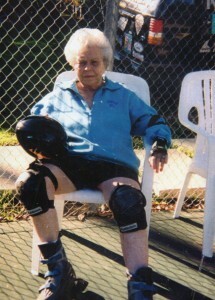 My Mom, the Roller Blader. She wasn’t really Roller Blading. My sister was at a park, saw my Mom near a Roller Blade outfit and it didn’t take much to convince her to put it on. My oldest sister, JoAnn, had an engagement party in New York at my brother-in-law-to be’s apartment. Both families were equally represented and it was the first time anyone other than my sister and my soon-to-be brother-in-law ever had both families in the same room.. Throughout diner, my sister’s in-laws bragged about this book and that book..And this author and that author. This went on all evening, hardly giving anyone else a chance to talk. Now, my Mom was an avid reader, but she didn’t feel she had to brag about it. Finally, during dessert, my Mom had a chance to speak. Rosalie, my brother-in-law to be’s mother asked my Mom, “Do you like to read,” asking it as if she were talking to some country bumpkin! Of course, my Mom, forgetting her manners for a moment, didn’t use any asterisks to express how she was feeling. My Mom was quite a character. Peru’s largest retailer has raised the prices of everyday items you shouldn’t buy for your Mom. The price for a bathroom scales has been raised from $59 to$8,572. An iron is “ON SALE’ for $8,799. Ans plastic flowers are being offered for $5,672–all in an effort to get you NOT to buy them. Click on the video so your don’t insult your Mom this year. CREDIT: Oechsle – Mom doesn’t want it from Yoshi Ishikawa on Vimeo. 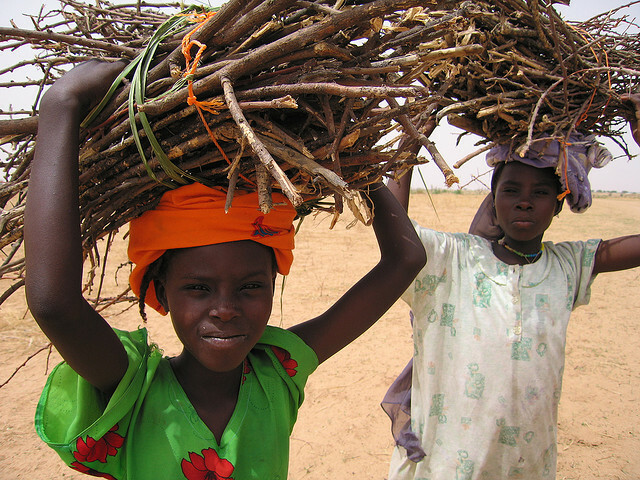 Darfuri women spend the greater part of their existence trying to feed their families. Now that you know what not to buy your Mom, here’s what you should buy her: Anything she wants. Something very special. Do you know what your Mom’s favorite thing is? Or at least something she really likes? Buy it for her even if she says, “Oh I don’t need anything. All I need is your Love.” She’s right about that. LOVE is more valuable than any material gift. But even still, honor your Mom with a gift she’d appreciate. As longtime Readers of this blog know, I’ve been forbidden from ever mentioning the name of the Love of My Life (my wife) and her offspring (my daughter) on my blog. They don’t read it. And they want to stay out of it. But since I know there’s little or no chance they’ll be reading this Mother’s Day blog, it’s safe to tell you want I got my wife for Mother’s Day. Theory. That’s what I got her. No, I didn’t get her a theoretical gift, I bought her two pants, a jacket and a sweater from the well-known upscale clothing line Theory. No, this wasn’t the gift. Just the garment bag it came in. Now, I know what you’re thinking. I must make a lot of money writing this blog if I can afford an upscale clothing line like Theory. Well that’s true, partially. I do make a small fortune writing 10 Minutes of Brilliance. But fortunately, I bought Margaret (Wait. 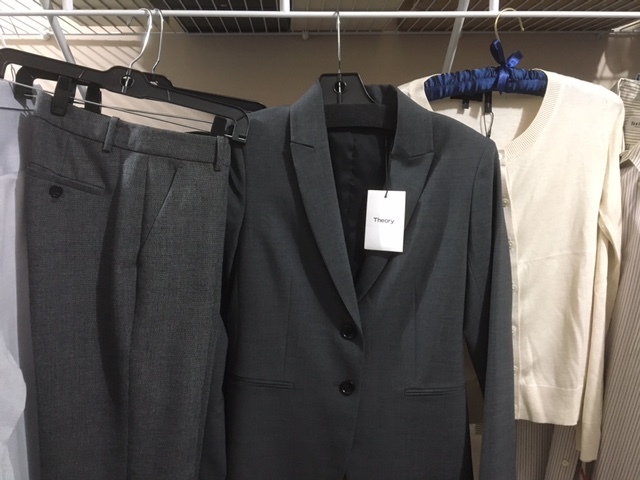 Forget I mentioned the name Margaret)… Fortunately, I bought my unnamed wife a few outfits from Theory’s Outlet store in Woodbury Common Premium Mall. Here’s what I got “Sir” ( A cute affectionate nickname I have Marg,.. er, my wife) for Mother’s Day. Sorry, Theory, I’m a Copywriter, not a Photographer. Rest assured they will look great on the woman who shall go unnamed. Happy Mother’s Day, unidentified lady. I know it’ll look great on her because Theory always does. Before reading the next post, please turn out the lights and hide, so we can surprise STAN. ALL OF A SUDDEN, OUT OF NOWHERE, THERE IS A KNOCK ON THE BLOG DOOR. STAN: Is this a knock knock joke? HARRIET: No, I think someone’s at the door. STAN: I didn’t know blogs have doors! HARRIET: Shut up, STAN, give Jack some creative license here. Will you just see who’s there?? STAN: Yes, how can I help you? STAN HAS NO IDEA THAT THE WOMAN STANDING IN FRONT OF HIM IS HIS MOTHER! STAN’S MOM: Don’t you recognize me, son? STAN’S MOM: STAN, I’m your Mother. STAN: Right! Look lady, I don’t have a Mother. STAN’S MOM: You do now! Jack just wrote me into the blog. STAN’S MOUTH DROPS OPEN. HE CAN’T BELIEVE WHAT HE IS HEARING. STAN’S MOM: Of course, STAN, I ought to know my own son, shouldn’t I? STAN: B-but, how are you so sure? STAN’S MOM: Your favorite food is steak. You hate asparagus and Lima Beans. And the only time you drink beer is when you’re having hard shell crabs. STAN’S MOM: Yes, with Old Bay. STAN: How do you know all that? STAN’S MOM: I’m your Mother, STAN. Of course, I know everything about you. It’s in my job description. Look, if you don’t believe me, just look over here to the right. STAN’S MOM POINTS TO THE LEFT SIDE OF THE BLOG, WHERE JACK HAS CLEARLY IDENTIFIED THIS NEW WOMAN IN STAN’S LIFE AS HIS MOTHER. STAN: It’s true! You are my Mom! God, this is the happiest day in my blog life. STAN’S MOM: STAN, how come you didn’t send me a Mother’s Day card? No card. No chocolates. No roses, No phone call. And when was the last time you cleaned up your room, Little Stanley? Or took a bath? Or ate your broccoli? Or visited your grandmother? STAN: Listen to her. She’s only been my Mom for five minutes, and already she’s driving me crazy. STAN’S MOM: I love you, STAN. STAN: I love you too….Mom. And now we pause for a moment of peace and wisdom! “When I die, I want to go peacefully in my sleep. Not screaming my head off like the passengers in his car. OK, Goys and Birls, that’s it for today. Thanks for stopping by and for staying til the end. It’s because of Brilliant Readers like you that we now have over 24,000 subscribers. Stay tuned for a very special blog, soon. The next time I get another Brilliant Idea! This is your bloggist, er, blogger, oh, what the Hell, it’s me saying goodbye. Good night. And drive safely. And Now a few words from our sponsor, Me. If you actually got to the end of the blog, then thank you so much. You’re obviously a homicidal maniac or a very loyal follower. But of you could do me one more favor and LIKE the blog and send it to your Mon. Sure, she’ll fall asleep reading it, but who cares? And while you’re at it, tell your Mom I said hi. Also, thanks to Michael Yublosky who helps me with SEO. In addition, Michael is a much sought-after Linked-In guru. That’s all for today, Readers, I appreciate your stopping by and staying for the long hall. Come back next time, whenever that is, when we will reveal The Top 10 Reasons Donald Trump Would Make A Terrible Advertising Copywriter.